On my first day at site, there was a funeral in the village for my counterpart's father. As I stood in the overcrowded community hall holding bowls of beef stew filled to the rim, men waved me over to serve them and in that moment, I chuckled to myself because I realized my life had reached full circle. In the U.S, I avoided funerals, particularly Hmong funerals or gatherings of any sort for that matter. These functions are a space where Hmong-Americans, regardless of how progressive they claim to be, fall back into their traditional gender roles. There are endless tasks for women to complete: vegetables that need to be rinsed, onions that need to be diced, dishes that need to be wiped, and men who need to be served. 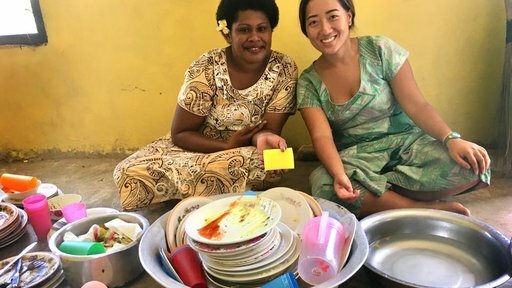 PCV Soua sits with a Fijian women helping with the dishes. While I cannot speak for all Hmong Americans, I observed the culture I inherited through the lens of the society I grew up in- suburban Minnesota. Like many third culture kids, I navigated two cultures that could not be more different. At home, I was lectured by the men and women in my extended family on the imperativeness of learning how to properly perform domestic duties or otherwise continue to suffer a life of poverty. What man would want to pay a bride price let alone provide for a woman who couldn't cook or clean? This, juxtaposed with the "Girl Power" mantra of the 90's and the mountains of books I read with strong female protagonists, confirmed my suspicions that my perceived gender did not make me inherently dependent on men to lift me out of poverty despite what I was told. Seven years later I applied to serve in Peace Corps and was accepted to Fiji. I admittedly did not research the country, its' culture, or language. Therefore, I was ignorant of the similarities between iTaukei culture and my own, which is how I came to stand in the community hall serving men and laughing at my predicament. It has been almost a year since the funeral. Since then I have spent countless hours serving hundreds of people alongside women in the village and taking turns delivering dinner to the homes of uncles and grandpas who are too busy drinking grog to eat. Although I do not find pleasure in these tasks, my presence in a space predominantly occupied by women introduced me to a source of knowledge and wisdom I had deprived myself from. When I am with women preparing food in the village, I am privy to conversations I might otherwise never hear. I have listened to women discuss financial matters, contraceptive usage, scoff at village by-laws, chastise men for intruding on their women-only grog circle, and the like. I have heard women who are change-makers and not victims to their culture. I started to see the gray area in gender roles which I initially assumed was binary. PCV Soua wears her traditional clothing of the Hmong people. When I asked myself, "How come Hmong women are not like this?" I realized that in America, I chose to not be present in those spaces because I did not value the work Hmong women engaged in. 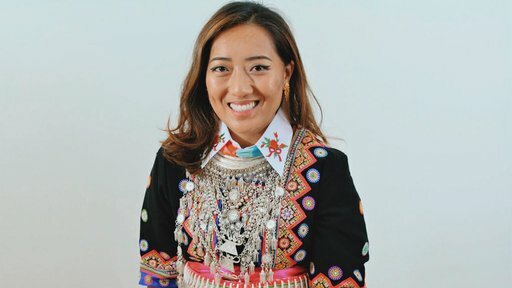 I viewed Hmong women as backwards, uneducated, and assumed I would not learn anything from them; and as a result, never did. When we are conscious of our western lens, we will inevitably ask ourselves, "Do I inadvertently silence the very women I intend to serve by assuming that they are oppressed because they perform domestic duties? Because I do not see or hear them speak during village meetings?” We will realize these observations are unreliable indicators of the state of women and the girl-child in Fiji and are indicators largely based on western feminism. "We see liberation as something that must come from within our own communities and nations- not something that is bestowed on us by people in power." Soua a first generation Southeast-Asian American. She has a a bachelor's degree in International Studies from University of Wisconsin-Madison. Soua is cool and she gets it, for the most part.